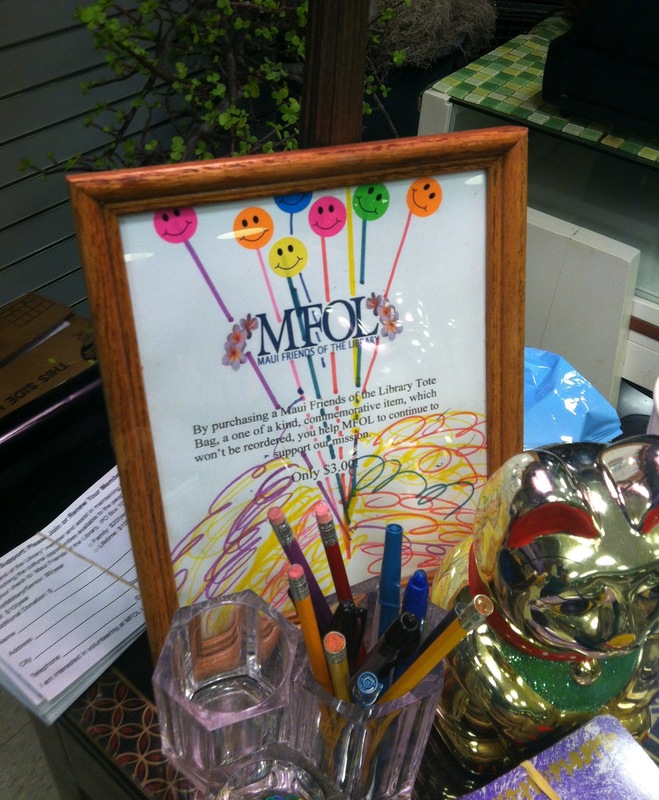 There's a Maui Friends of the Library Used BOOKSTORE at Kaahumanu Center! I had to see it for myself! A Maui Friends of the Library used bookstore in the Queen's Center? How would that work? After all, there are already two other MFOL used bookstores on the island, right? -- the original (awesome) Pu'unene store, and the recently opened MFOL Used Books Lahaina in the Wharf Cinema. Could Maui support three? And, what's more, one that's smack dab in the middle of Central Maui's busiest shopping center that specializes in all things NEW? 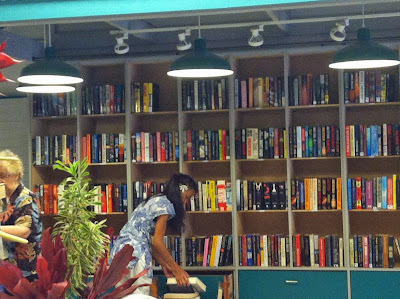 I'm happy to report that this bookstore is a can-do sort of business that can work very well indeed, thanks to a dedicated cadre of volunteers and support from the Maui community. And the answer is -- ta-daaaah! the store already fits in very well at the Center! The soft opening was on Saturday, July 14, and the response from the community so far has been fantastic, according to Alika, who took time out from setting up to chat with me. Alika is responsible for the store's window displays. a lady plucked a book from the display and purchased it. Expect to see more fabulous windows like this one! The grand opening for the store will be sometime in October, to coincide with the Centennial Celebration of the founding of the Friends of the Library organization on Maui. Activities for children are planned at the store -- hurray! I talked to store manager Machele Stabler on the phone after my visit and she said news of that will come after the store is more established. The shelving was built by Machele's engineer husband Tom. Notice the live tropicals and the great green overhead reading lamps. Right now the front of the store, which has a shelving capacity of 2,000+ books, is very nicely set up with floral arrangements throughout, and inviting indoor-outdoor furniture smack dab in the middle. (Sorry, no photo of the furniture. I didn't want to disturb the readers there). 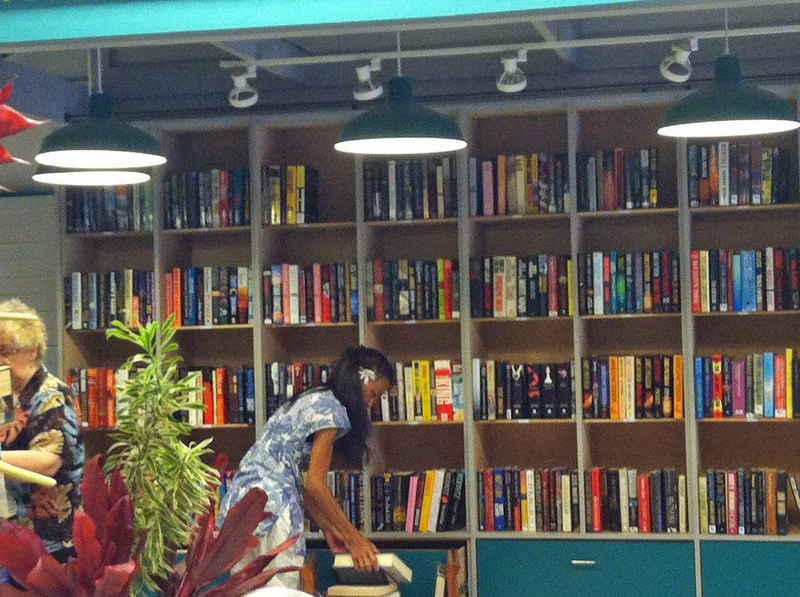 When the entire store is stocked, there will be room for 30,000 books -- hurray again! The prices? Paperbacks are 50 cents and most hardbacks are $1! 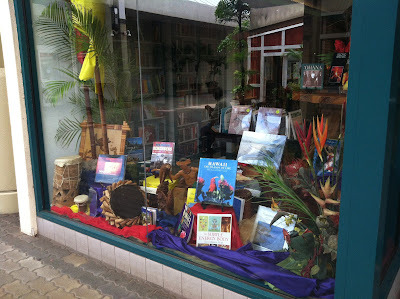 The only books that are priced at full value are the Hawaiian books that the Friends purchased new, mainly for tourists. How can you beat those prices? All books are hand-picked, from donations received. the ambiance of the store: down-home and inviting! How could this seemingly impossible dream work, I wondered? Well, I found out that a venture like this one does indeed take a village. Everyone working at the store volunteers their time (the dedication of these people seems to know no bounds), 99% of the books are donated by readers like you and me, and since MFOL is a non-profit organization, they have some sort of modified contract with the Center (confidential, of course). What a great model for Doing Good for Literacy, with everyone getting involved! The lease is for a year. A lot can happen in a year, and I hope the people of Maui will support this worthy way of celebrating books and reading! How does one donate books? Easy!-- just bring in your in-excellent-condition books to the store! Where will the profits go? All profits from all three stores benefit Maui's public libraries. From their mission statement: "The Friends use these monies as well as membership dues to fund various items and programs for Maui County Public Libraries ..."
Thrilling news for me is that MFOL will be able to provide five $2,000 scholarships to students interested in pursuing a Master's Degree in Library and Information Science (UH Manoa or UH Maui). MFOL was able to offer only two scholarships last year, so the future looks bright! 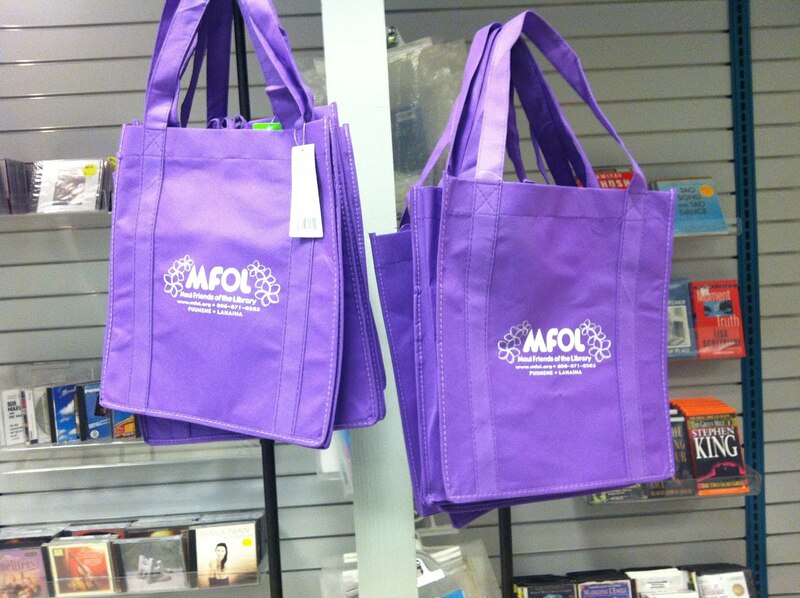 You can buy these bags -- another way to support MFOL. What is the store's greatest need right now? Machele is looking for evening volunteers. Right now 22 volunteers work during the day, but none work during the evening. The hours to fill are from 3:30 to 9:00 pm. If you're interested in volunteering, give Machele a call at 877-2509 with any questions you might have, or you can go directly to the store to fill out a volunteer form. Store hours are 9:30 am to 7:00 pm Monday through Saturday (to 9 pm if they can get volunteers), and 10:00 am to 5:00pm on Sunday. The store is located a couple of doors down from Sears, mauka side. The spot started out as the Book Cache (now that would be a cool blog post, about how things come full circle). Most recently it was the Whaler's General Store, hence the great green tin roofs you'll notice as you enter. The book and reading ecosystem on Maui is feeling more balanced to me now, thanks to the superb work of MFOL! Now if we could just get a bookstore in central Maui to replace the much-missed Borders .... is that dream so impossible? Shout Out to Puk Sup in Upcountry Maui! 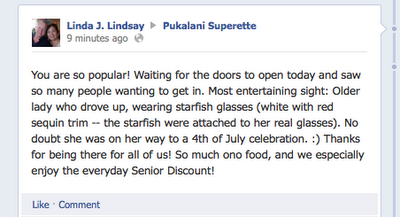 Just a spontaneous mini-post to celebrate Pukalani Superette, affectionately known to many as Puk Sup. So many people shop at Puk Sup! There are a lot of things I like about Puk Sup (especially the fresh produce, the interesting sides, the bento section, their hot daily specials). And the history of Puk Sup is so interesting! So happy that this mom-and-pop store is doing so well!